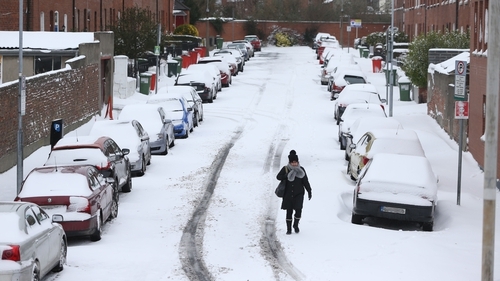 Unions and politicians have criticised employers who say staff must give up annual leave for days they could not work during the recent snow storm. It follows moves by a number of companies including one of Ireland's largest agribusiness companies, Dawn Meats, to deduct annual leave from employees, or to give them the option of unpaid leave for days when they were unable to attend work. Dawn Meats said that this is the norm in the sector. However, Labour Employment Affairs Spokesperson Ged Nash called on Dawn Meats to reverse its decision, noting that it was not the fault of employees that a status red weather warning was issued, triggering a Government instruction to the public to stay at home. He called for clear red alert guidelines to avoid workers bearing the cost of closed factories or other enterprises. However, small business lobby group, ISME, warned that many businesses simply could not afford to pay staff when they had lost revenue due to closures. ISME Chief Executive Neil McDonnell said hundreds of millions of euro worth of trade had been lost during Storm Emma and a lot of small and medium enterprises who had lost turnover would have difficulty paying staff and traders before the end of March. He also warned that legislation would not resolve the matter as new laws would not address where there was simply no money to pay. Meanwhile, there are fears that a Health Service Executive decision to give additional annual leave to staff who worked during the most severe weather will trigger knock-on claims across the public sector. The HSE is to award relevant staff up to two days extra annual leave, while staff who were unable to attend work will be paid as normal. The HSE has not yet calculated how many staff will be entitled to the additional leave, or the cost of the initiative. Asked whether approval had been sought from the Department of Public Expenditure and Reform to grant the additional leave - which could lead to a higher agency workers' bill to plug resulting staffing gaps - the HSE said it had been an internal HSE decision. There are mounting fears of knock-on claims to replicate the HSE extra leave allocation with SIPTU warning that local authority staff will seek similar treatment. The Garda Representative Association is to discuss the matter later this week, while the Association of Garda Sergeants and Inspectors has written to the Garda Síochána Human Resources Department in relation to the issue of leave days. The Department of Public Expenditure and Reform said the implementation of annual leave policy is a matter for each sector. It said the department has not received any submissions for additional sanction for annual leave from Health, Justice, Housing or Education in relation to the weather event two weeks ago. Meanwhile, employment law specialists say there is no legal clarity about the rights of employees affected by severe weather incidents. Senior Counsel Cliona Kimber said that factors to be considered included health and safety, adding that it would be harsh for an employee to be deprived of annual leave if their employer shut down the workplace. She said an employer appearing before the Workplace Relations Commission could find it hard to justify such a refusal to accommodate a worker if the employer had closed the business.